For the novice gardener and frequently the more experienced gardener, some of the terms used in books and web pages may not always be clear. To avoid any possibility of confusion we explain here any terms used in this site which may not be immediately obvious to everyone. The terms are arranged in alphabetic order and many link off to other pages which discuss the subject in more detail. Biennials are plants which grow in their first year, undergo winter and then produce seed seeds in the second year. A typical example of this is an onion plant. It grows in year one producing the onion bulb. It then goes dormant in winter and in spring of year two it uses the onion bulb as food to help produce a flower and seeds then dies. Blood fish and bone is an organic fertiliser which has been used by gardeners for many decades. Because it is a natural product the Nitrogen, Phosphorus and Potassium contained in it vary slightly but in general it is a balanced fertiliser. Not surprisingly it is made from blood, fish and bone and nothing else. One of its key benefits to the gardener is that is breaks down slowly in the soil, releasing nutrients over a long period of time. Normal application rate is about 50g per square metre, although it ca safely be applied at higher rates if mixed well into the top soil. It is our fertiliser of choice and we much prefer it compared to Growmore. Brassicas are a family of vegetables which include cabbages, brussels sprouts, cauliflower, swede, turnip, broccoli, calabrese, kale, chard, spinach and kohlrabi. They tend to be grouped together under the name of brassica because they are in the same group as far as crop rotation and soil conditions are concerned. They also commonly suffer from the same types of pests and diseases. The Brix Rating is a measure of the sweetness of a solution. The higher the Brix rating the sweeter the solution. This is often applied to vegetables fruits and other plant produce. For the same variety grown on different soils and in different conditions the Brix Rating will vary slightly but it is still a good comparison. Cloches are portable covers which protect plants from adverse weather conditions. They provide excellent wind protection, good protection from many insects and a couple of degrees frost protection. Cloches are most commonly put in place in spring or late winter a couple of weeks before they are needed. This encourages the soil underneath to warm up before planting. The cloches are then left in place until the plants are established and the correct weather conditions have been reached. At that point the cloches are removed. At the end of the season in autumn they can also be used to extend the growing season for smaller plants. Latin name Elymus repens which spreads mainly by underground roots. This grass also produces small amounts of seed. It is identified by amass of roots which form just below the soil surface. See here for details on how to remove couch grass. A plant which has undergone selective breeding with a specific purpose in mind. Cultivars are not naturally occurring in the wild, human intervention is always involved. This is cutting / pinching off flower heads as soon as they begin to fade away and shrivel. 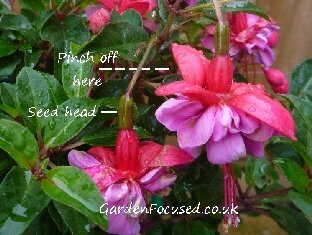 Doing this will stop the plant from setting seed and therefore encourage it to produce more flowers than it would normally do. It's important to cut off the flower just below the seed head which normally at the base of the flower. 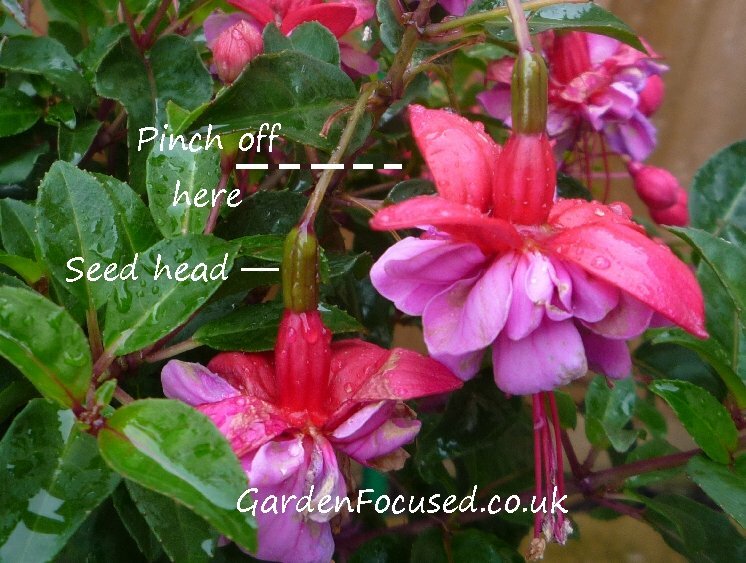 As an example we show a picture (click the picture to enlarge it and see more clearly) below of where to dead head a fuchsia flower, the principal remains the same for almost all flowers. This is a compost used for container growing certain types of plants. It is slightly more acidic compared to standard composts and is free from lime. This suits some plants such as azaleas, blueberries and camellias to name a few. WHAT IS A FOLIAR FEED FOR PLANTS? A foliar feed is a liquid feed sprayed onto the foliage of plants. There is no current agreement to what extent this works or doesn't work. F1 seeds (sometimes known as F1 hybrids) are mainly produced commercially by seed companies. They are produced from two known varieties and all the F1 seed is the same. The actual term F1 stands for First Filial. In almost all cases F1 seed is more expensive (per seed) compared to normal (open-pollinated) seed, sometimes 15 times more expensive. The subject of F1 seed gets more complicated the deeper you dig and this "jargon buster" is not the place to discuss this subject in detail. However, money, money, money (the seed companies money!) is behind a lot of the hype of F1 seeds and surprisingly large numbers of well educated people believe the hype. Here are just a couple of our views on F1 seed for you to ponder on. The seed companies claim that if you take seed from an F1 plant it will not come true to type. That's misleading because in many cases it will come true (or so nearly true as not to matter) and understanding that can save you an awful lot seed money. Are F1 seeds actually that much better than open-pollinated seeds? The root of all evil, money, comes into equation again. The seed companies use the F1 myth to generate huge profits compared to the meagre profits available from open pollinated seed. Don't get sucked in by that hype! Decide for yourself and don't be convinced by advertising. One word of advice about comparing F1 seeds to GM (genetically modified) seeds. They are two completely different things. F1 seeds have not been genetically modified. They have simply been grown, in controlled conditions, from two specific varieties. There are endless types of liquid plant feeds, this section sticks to general purpose balanced feeds and tomato type feeds. There are many different brands of liquid feeds but they all produce very similar results. Our advice is to buy the cheaper "own" brands. A general purpose, balanced liquid feed has three key elements in it, nitrogen, phosphorous and potassium. The ratio is about Nitrogen 12, Phosphorous 4 and Potassium 8. This high level of nitrogen will encourage lots of leaf growth. A typical tomato fertiliser has the same three key elements in it but in different amounts. Nitrogen 4, Phosphorous 4.5 and Potassium 8. This encourages the growth of fruits. Germination occurs where a plant seed starts to sprout into growth. Different plant seeds require different conditions for this to occur. Almost all seeds require moisture to begin growing and different seeds will only germinate in certain temperature ranges. Note that many seeds germinate below the surface of the soil and a seedling may take days or weeks more to actually emerge above the soil surface. The seeds above have been germinated on kitchen paper to show how the sprout has emerged from each of the seeds. Click on the picture to enlarge it and see more clearly. When seedlings are grown indoors or in a greenhouse they are protected from fluctuations in temperature and also from the effects of wind. If plants which have been grown indoors / greenhouse are planted outside suddenly they will suffer a shock. To avoid the shock it is best to place plants outside for a couple of hours on the first day, increase the exposure to outdoor conditions each day over the next week or so. This will help the plants to gradually become accustomed to outside conditions. This process is call hardening off. After plants have been hardened off they can be permanently planted outside. 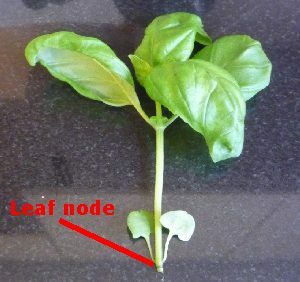 A leaf node is that part of a plant stem where a leaf, or two leaves, join the stem. The picture below illustrates this clearly. Just below a leaf node is often the best position to cut to when taking cuttings. Mulching can be a complicated subject but in reality it consists of a layer of something (grass, wood chip, black plastic etc.) laid over the surface of soil to conserve water, heat and discourage weeds. As with most gardening techniques there are cheap and expensive methods, attractive and ugly methods, all of which may achieve the same end. A common mulch is garden compost which is typically laid around growing plants. As well as achieving all the normal mulch functions this method will also provide a slow nutrient feed as the compost breaks down further. Grass clippings or chipped bark are also an effective and often free mulch. Slightly more costly and definitely ugly looking is a thin layer of black plastic. When compost or other organic matter is not available as a mulch then buying a roll of black plastic is a good alternative. Make sure when you lay out the mulch that it has lots of holes in it to allow rain water to reach the soil below. Mulches can be bought at most garden centres or online delivered to your door. Nematodes are tiny animals which live in the soil. Some of them are known to attack bugs and it is for this purpose that they are commonly used by gardeners. They are sold at garden centres and online for use against specific bugs, for example the vine weevil. Many only work effectively within certain temperature ranges. They are normally applied to the soil in liquid form. Organic matter comes from living things; plants, trees or animals are the common source. When organic matter is decomposed (well-rotted or composted) it becomes very suitable for adding to your soil. Examples of organic matter used in gardens are the contents of a compost heap, peat, blood, fish and bone to name but a few. Adding well composted organic matter to the soil opens its texture allowing air to circulate better. It also introduces organisms and nutrients into the soil which keep it in good condition. Another major reason for adding organic matter to the soil is that it increases the water retention but at the same time makes the soil free-draining - ideal conditions for many fruits and vegetables. A perennial plant is one which can, if conditions are correct, live for more than two years. Common examples are roses, many herbs including oregano and marjoram, rhubarb etc. Pinching out is a method of pruning new growth on plants by pinching a soft stem with the nails of your forefinger and thumb. It could just as well be done with a pair of secateurs but because the growing stems are so soft its easier and quicker to do it with your fingers. 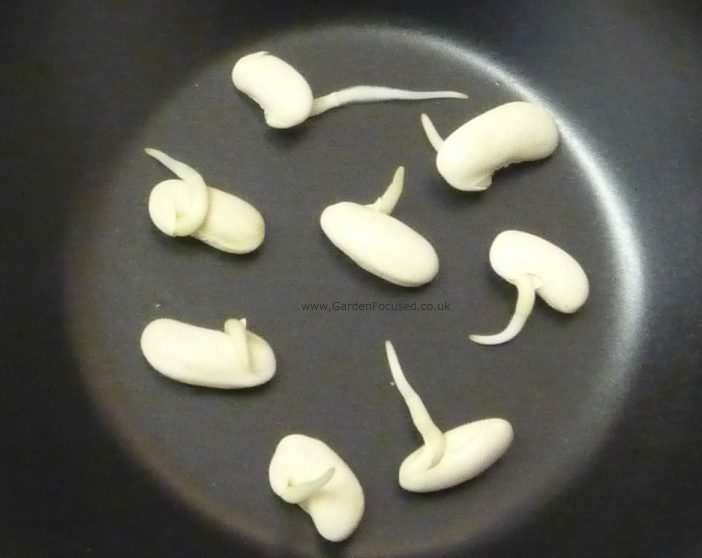 A common example of pinching out is when the tips of runner bean plants are pruned to stop them growing higher and encourage more bushy growth lower down. Pollination is the process where pollen (formed on the male anther) is transferred to the stigma (female part). These parts are found in the flowers of fruit trees. Transfer is accomplished naturally by insects such as bees crawling inside the flowers because they are attracted by the nectar. Only when pollination occurs will fruit be produced, no pollination means no fruit. Many fruit trees such as pears, plums, apples and cherries are classified as self-sterile which means they cannot be pollinated by themselves not another tree of the same variety. For pollination to occur with self-sterile trees they need another tree of a different variety nearby for pollination to occur. Also the tree must be of the same type, in other words an apple tree can pollinate another nearby apple tree but it cannot pollinate another pear / plum / cherry tree. Some fruit trees are classified as self-fertile which means they can be pollinated by themselves or others of the same variety and type. Pollination can only occur when the flowers are in bloom and with fruit trees this period of bloom is generally restricted to a period of roughly three weeks. At the beginning week of the bloom period about 10% of the flowers will be in bloom, this will increase to about 80% in the second week and drop of to the remaining 10% in the third week. Any stage in this three week period is normally fine for successful pollination to occur. Different varieties bloom at different times and it is important to ensure (for pollination purposes) that that there is an overlap between period of bloom for one variety and another. All our fruit articles contain information showing which varieties overlap and can be relied on to pollinate each other. As potted plants grow, the roots grow to occupy the available space. In many cases when the roots are showing at the sides of the root ball it is best to transfer the plant to a larger pot and infill the empty space with new compost. This is the process of potting up. It can occur two or three times in the growing life of a plant. Secateurs are a gardening tool used to prune / cut small stems from plants, trees and shrubs. Usually they are sprung loaded so that they spring open after the cut is made. They should have a clip to hold them together so that they are safer to carry around. As a general rule, the better quality the secateurs the higher the price although of course there are exceptions. There are two different types of secateurs, bypass and and anvil, most are bypass secateurs. Bypass secateurs works like scissors with the two cutting edges passing over each other to make the cut. Anvil secateurs have one blade which comes down on a flat surface to force the cut. There are endless other variations on these two basic designs, there are even secateurs with adjustable handles to suit two or more people hand sizes. All of them appear to be mere gimmicks to our eyes. Bypass secateurs are preferred by every gardener I have ever met and all the professionals. Our advice is simple by the best pair of bypass secateurs you can afford. A good pair will last you thirty years or more. The picture on the left shows my Felco secateurs which are 20 years old. They may look a bit drab after all those years but they work perfectly, the blade is still as sharp as any kitchen knife we have and they have been left out in the rain for protracted periods many, many times. 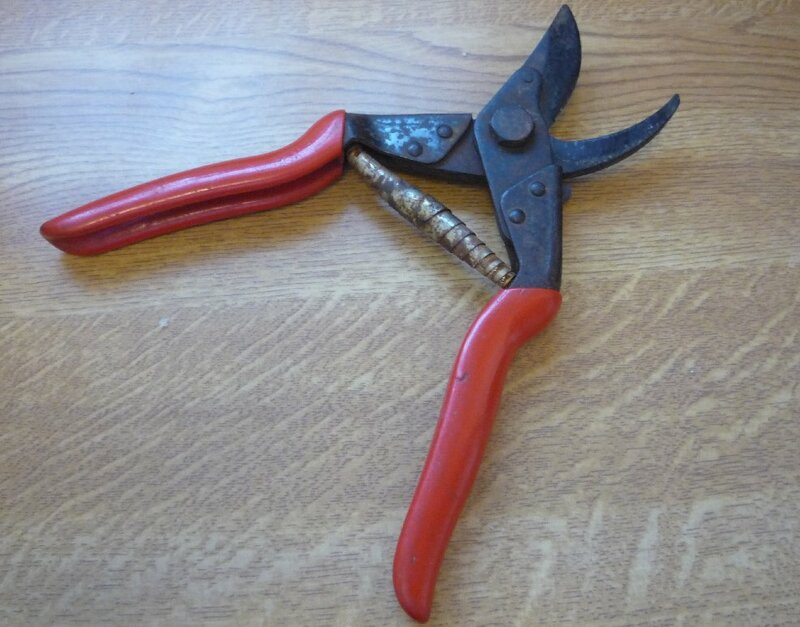 Buying cheap secateurs will quickly result in cuts which are not clean and they will last a year or two at the most. This term is normally restricted to fruit trees. A sport occurs where there is a naturally occurring genetic mutation which causes a plant to develop slightly differently from the normal. For example the apple tree Gala has the parents Kidd's Orange Red and Golden Delicious. A genetic mutation occurred in the past which resulted in a slightly different tree which is called Royal Gala. Most genetic mutations result in plants which are inferior to their parent but occasionally, as in the case of Royal Gala, they have characteristics which are thought to be worthwhile. These are twig like growths which appear at the base of shrubs and trees. The form just underground from the roots and stem. In almost all cases they should be cut out as low down as possible because they sap the strength of the main plant. Thinning out fruit is the removal of some developing fruit to ensure that the remaining fruit develops to its full size in a healthy manner. In the case of some fruit, plums in particular, thinning out also greatly reduces the weight of the fruit and prevents branches breaking. Common fruit which is often thinned include apples, plums, pears and peaches. See our individual articles on particular fruit for when to thin and to what degree. With all fruit though this job is done when the fruits are young and not fully developed. The fruit can either be snapped off by hand or a pair of secateurs can be used. Pollination is the process by which plants produce seeds. Normally flowers are produced and within the flower there is pollen and there is also a stigma. The picture on the left illustrates a typical flower structure. Pollination occurs when pollen is transferred onto the stigma causing a seed to start forming. Different plants have different mechanisms for transferring the pollen. The most common are insects or wind. 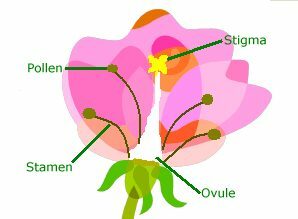 If pollen is transferred to the stigma on the same plant (i.e. only one plant is required) this is called self-pollination. Where more than one plant is involved this is called cross-pollination. When sowing seed some will germinate into living seedling whilst others will die. The rate of success varies wildly between different plants. So when sowing seeds it is necessary to sow more than is really required. This will almost always result in overcrowding of the seedling so some will need to be pulled out to ensure the spacing is correct. This process is called 'thinning out'.